Gold and silver futures slipped on Friday and they both recorded weekly losses. Platinum also dipped on the day but it edged up on the week. Palladium, meanwhile, surged on Friday to pad its weekly gain. Gold for August delivery on Friday fell $5.40, or 0.4%, to settle at $1,299.30 an ounce on the Comex division of the New York Mercantile Exchange. "Treasuries are up, the dollar ticked back up and there’s no geopolitical news really supportive of gold at the moment," Reuters quoted Philip Streible, senior market strategist at RJO Futures. Gold futures traded 0.3% lower this week after rising 1% last week. They inched down 0.1% on Thursday, the final day of May, logging a monthly loss of 1.1%. The precious metal is 0.8% lower on the year to date. "Fourteen market professionals took part in the survey. There were 10 votes, or 71%, calling for gold prices to fall. There were two votes each, or 14%, for gold to rise or else trade sideways. Meanwhile, 578 voters responded in an online Main Street survey. A total of 296 respondents, or 51%, predicted that gold prices would be higher in a week. Another 182 voters, or 31%, said gold will fall, while 100, or 17%, see a sideways market." Elsewhere on Friday, silver for July delivery dipped 1.7 cents, or 0.1%, to finish at $16.441 an ounce. Silver futures shed 0.6% this week after moving exactly opposite, up 0.6%, last week. They are down 4.1% on the year so far. July platinum declined $3.40, or 0.4%, to $906.70 an ounce, but registered a 0.6% weekly increase. Palladium for September delivery advanced $14.90, or 1.5%, to $996.60 an ounce, for a 2% gain on the week. The pair is lower on the year to date with losses of 3.4% for platinum and 6.1% for palladium. Gold declined $10.75, or 0.8%, to $1,294.60 an ounce. Silver fell 13 cents, or 0.8%, to $16.42 an ounce. Platinum lost $4, or 0.4%, to $903 an ounce. Palladium rose $5, or 0.5%, to $991 an ounce. 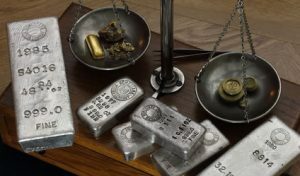 In LBMA results for the week, palladium rose 1.3% while the others logged losses reaching 0.7% for fold, 1.5% for silver, and 0.6% for platinum. Gold bullion coins advanced by 6,000 ounces this week after they jumped by 16,500 ounces last week — their biggest weekly increase since the week ended Jan. 12 when the newly 2018-dated issues launched. All sales this week resulted from American Gold Eagles. Splits last week included 10,000 ounces in American Gold Eagles and 6,500 ounces in American Gold Buffalos. American Silver Eagles sales were muted this week — a rarity — after they climbed by 230,000 coins last week. Sales of five-ounce silver bullion coins were muted for a sixth week in a row. 2018 American Platinum Eagle sales were also flat this week. Last week they rose by 10,000 coins for their first gains in a week since the one ended Feb. 16.